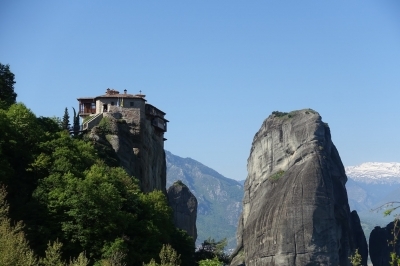 'Meteora' comprises a group of 7 monasteries, built on high rock pillars. They were founded in the 14th and 15th centuries as an expression of life in solitude. They also offered protection in times of political instability. In the heydays there were 24 monasteries, now there are only 7 left of which 4 are still inhabited by monks or nuns. The iconic sandstone rock pillars were created about 60 million years ago by the effects of rivers and earthquakes. Meteora stands for a group of 7 monasteries built on high rock pillars, pillars which were created by erosion and earthquakes 60 million years ago. This is a really accessible tourist attraction (certainly a candidate for our ‘one million visitors or more’-connection, but I could not find details that confirm this) and much info on it is readily available. So I’ll just focus in this review on getting around by public transport and the enigma of the 7th monastery. I stayed overnight for 3 nights in the town of Kastraki, which lies just in the foothills of the Meteora mountains. This proved to be an excellent choice; only for an ATM or bus connections to long distance destinations you have to walk 2km to the next city, Kalambaka. When the bus tourists are gone later on in the day, Kastraki is a cozy place with a few restaurants and always those beautiful views. 4 times a day (at 9/11/13/15h), a public bus starts from Kalambaka, stops at Kastraki (opposite to the church) and makes further stops at all monasteries. It is a normal public bus costwise at just 1.80 EUR one-way. But the company does send an English speaking guide along who takes care that everybody leaves the bus at the right monastery. Also, there is a 10 minute stop at a view point included. This all combined results in a journey of about 50 minutes for the 8km stretch from Kastraki to the furthest monastery, St. Stephen’s. From there, I walked back all the way down visiting 4 of the monasteries along the road. While preparing for the visit to this WHS, I noticed that there are 7 monasteries named at the map at the UNESCO website. This differs from the 6 that are generally mentioned in tourist literature and were also in my original introduction text on this website. However I found no precise location or more common name for this enigmatic ‘Monastery of the presentation of Jesus Christ’. Coincidentally I joined a Meteora hiking tour on the second day of my stay in the area. 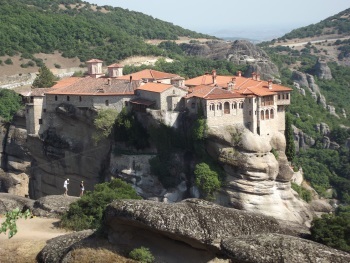 This is a very recommendable hike of about 3h walking plus 1.5h visiting 2 monasteries, the Great Meteora and Ipapantis. I am now fairly sure that the monastery of Ipapantis is the 7th monastery that is meant in the nomination. It lies virtually at the back of the mountain of the Great Meteora and was a kind of annex to it: a smaller rock-cut setting where monks could retreat to from the busy Great Meteora monastery. Ipapantis has only opened to tourists since last year. It lies somewhat off the main road and therefore is only accessible to hikers. It is not in religious use anymore and there also is no entrance fee. There is a caretaker though who shows you around. The monastery has been restored in the year 2000 and is in very good condition. The church is completely original and lovely. There was only space for 8 monks up here. In general, I preferred Meteora's natural setting above its monasteries. Of course it was very clever that the old 'Meteorites' founded their churches and monasteries on these peaks – and all that without the access roads of today. But the monasteries are barely functioning as such anymore and their interiors most of the time aren’t worth the repeated 3 EUR entrance fee, except for a single church covered with murals such as at Rousanou. 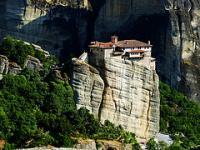 For those who have been to Meteora before, it may come as a surprise: It wasn’t that high on my list. Indeed, my original plan had been to skip it entirely. 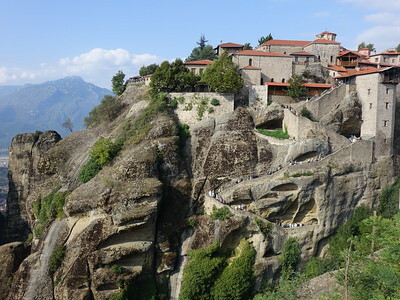 But then several factors (Mount Athos permit being granted, my flight being rescheduled and my family having a get together) forced me to redo my schedule with one day to spare for going to Meteora. Lucky me. Because apart from saving money on the flight home I got to take in this great site. It truly ranks with the best. Of the six monasteries I visited three: St Nicholas, Rousanou and Varlaam. Great Meteora was closed for the day, but I made my way to the gate and viewpoint. The highlight, though, was hiking up the mountains and taking in the stunning views of monasteries and landscape. It’s true that the big monasteries are overrun with tour groups. The area you can visit per monastery is quite limited and a few busloads will quickly bog down all traffic. In one case a tour guide felt the need to do a lecture in a tiny chapel blocking all ins and outs. A better crowd management would come in handy. Luckily, the bus loads don’t visit all monasteries. They are limited to those offering proper parking. As a consequence, the smaller ones are more relaxed. My personal highlight was Saint Nicholas as you got to see more of the inside rooms than elsewhere. It’s the lowest one and the first one you will pass when you hike up. Short connection times with the train are not a concern. The local train to Kalambaka will wait for the inter city trains. In Thessaloniki the ticket office opens really early, so no need to pick up the train ticket the day before. The bus station in Kalambaka is not at the train station, but closer to the town center. The town is dotted with maps and the bus station is well marked on these (front side Meteora, back side town). At the bus station you can also get the ticket from Trikala onwards to save yourself the hassle. The journey from Kalambaka to Trikala really takes 40min and the terminal there lies on the outskirts of town, but has sufficient amenities. I would try to opt for the train connection. It’s faster and at least for Thessaloniki it drops you off in the city instead of the outskirts. Finally, there seem to be plenty of tour operators offering day trips if you prefer things organized. There is a bus that will take you up the mountain from the train station. Not sure about the schedule, but if this wasn’t Greece I would assume it’s aligned with the arrivals of trains. Personally, I just walked. It takes 1.5h up and 1h or so down. The views (and pictures) you will get by walking are stunning. Unfortunately, there is no dedicated hiking trail or even sidewalks for that matter. If you are short on time or stamina, you can take the bus up and walk down. All monasteries have a dress modestly policy in place. Best to wear long trousers and a long armed shirt. All monasteries close one day of the week. Check the schedule in advance if there is one you definitively want to see. This was my third visit to the site since 1970.I was horrified to find how this once quiet, idyllic site had become overcrowded and congested. I reached Kalambaka by train from Athens, having picked my way through the crowds of refugees occupying the Athens railway station. From Kalambaka I continued by train northwards to Thessaloniki. I visited this WHS in June 2014. I was based in Kastraki, just a stone's throw away from the monasteries of Meteora proper, where I spent 2 days exploring the monasteries on foot. I visited all the 6 monasteries even though they cost 3 euros each. The interior frescoes and sense of tranquillity inside the monasteries early morning and late in the afternoon when the tour groups are gone is equally outstanding as much as the surrounding natural setting. My favourite interior was that of St Nicholas although smaller than the other monasteries. My favourite exterior is that of the Holy Trinity as it's perched on the highest rock next to the most accessible monastery. There are several panoramic viewpoints to visit and the best time for photography is late in the afternoon. Meteora is undoubtedly my favourite non-classical WHS in Greece and I really hope to visit again in the near future. "Columns of the sky" is an accurate description for Meteora, one of the relatively few sites in the world inscribed on the WH list for both cultural and natural criteria. The landscape of this region in central Greece is just stunning, with its majestic spires reaching high into the sky. This would probably be reason enough for inscription, but the monasteries on top of the spires are just mind-blowing. I´m not sure whether the obvious question of why these monasteries were built in these locations in the first place has yet been satisfactorily answered, but it doesn´t really matter. The monasteries are almost as interesting from the inside as from the outside and will give you a good overview of Byzantine architecture and painting, as well as of the Orthodox church. Some can only be reached on foot, via many, many steps, but it´s definitely worth the effort. Obey the clothing rules! Meteora is easy to reach on one of the numerous daytrips offered from both Athens and Thessaloniki, but the driving makes you shudder and suspect that the bus will fall off the cliffs at any moment. Don´t look down, but if you do, you won´t see any buswrecks littering the slopes, so I guess it´s all very safe after all.. The geographical features at Meteora are spectacular. It's reported to be an ancient seabed. Towering limestone pilars rise out of the earth, much like what little children make with sloppy sand at the beach. The views are awe-inspiring and one can see why hermits and ascetic monks would choose to live their lives there. Contemplation of un-earthly matters is inevitable the longer you spend there. The monastaries are lovely, though it's unfortunate that one can't be raised up in the nets they used in the past. Women, be sure to wear long skirts or have some kind of shawl to wrap around yourselves. You will not be permitted to enter wearing pants, and certainly not if your legs aren't covered. I used a sarong and it worked out just fine. Metéora consists of about 60 huge columns of rock, up to 984 feet high, many large enough for a monastery to be built on the top. Starting about the year 1000, and extending into the 1500’s, 24 monasteries were built, but now only four are inhabited. Since the monks wanted to be alone, until recently access was by means of very long ladders or a basket or net suspended on a rope. Now they have added staircases with hundreds of steps, but for a tourist, it’s well worth the climb. The large monasteries look tiny on the tip of these peaks. Drove up the steep twisty hairpin roads stopping to take pictures, and stopping for breakfast overlooking The Varlaám monastery, a little below the Megálo Metéoro, the largest of the group of monasteries. We later walked up hundreds of steps to visit these two ancient sites. One million visitors or more: "Large numbers of visitors, around two million per year, flood the site (conventional forms of tourism mainly, but also partly related to religious, cultural, eco-tourism, and sports tourism) (Lyratzaki, 2007)"